The Lord reminded me of these verses this morning. I read it out of the NLT and then the Amplified. It really hit home for me. You see I am currently going through a season of intense discipline and training through many trials and temptations. (Hebrews 12)The demonic attacks are so evident. I have felt pressed in on every side by spiritual oppression in some of my closest relationships. Even my children are under attack. At times I feel crushed and overwhelmed. The problems and trials I face often times feel like too much to bear. I would be lying if I said that thoughts of giving up don’t run through my mind. But I know who I am in Christ Jesus and I WILL NOT not be driven to utter despair! I know that our Lord has NOT deserted me or my family and left us to stand alone. I am sharing this with you because I want you to know that if you are suffering through many troubles, trials, and temptations YOU ARE NOT ALONE! Listen to what the Holy Spirit has said through Paul in 1 Corinthians 10:13. Here’s parts of this verse out of the Amplified. “NO temptation or trial has come to you that is beyond human resistance.. In 1 Corinthians 10:13 we see that He has promised to never allow the temptations or trials that we face to be more than we can endure. He will ALWAYS provide a way of escape to overcome any temptation the enemy will put before us. He will also ALWAYS provide a way for us to go through whatever trial it is that we may have to face. No matter what it is that we are facing we need to remember that He is our Strength and WE CAN do ALL things through Christ Jesus who strengthens us! Here is Philippians 4:13 in the Amplified. Read it. Receive it! Believe it! Confess it! The Lord has spoken to me so many words of encouragement, affirmation, and comfort over the past several weeks. His Holy Spirit has ministered to my heart and given me peace at times where I probably would have fallen apart. He has hugged me through the arms of other believers full of his love and compassion. His presence has filled my room as I slept I knew that He was there with me. His love has sustained me through this all. He will do the same for you as he is doing for me! Do not give up hope! He is by your side. You will see His promises to you fulfilled. Just keep believing! Keep trusting! Keep seeking Him in prayer, fasting, and in His Word. Keep your eyes on Him and you will not be destroyed. 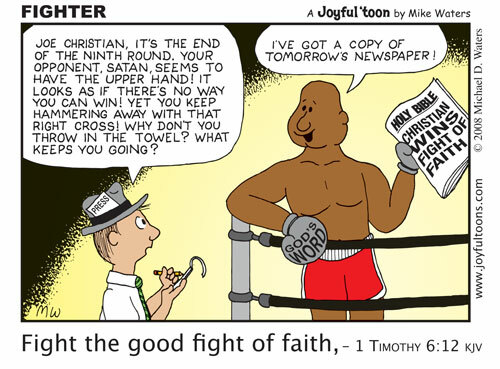 Fight the good fight of faith! Glory to God Logan. Put on your praise music when those anxiety attacks come. I'm telling you it works. The spirit of heaviness and worry lifts. It can't stand to be in the presence of praise and worship. And as you worship and praise you will find that you are being encouraged and lifted up in your spirit and soul. Some battles will be tougher than others. There have been times where I have to walk around with my ipod on. But I don't give up. You don't give up either. Blessings to you brother!